In fall 1996 Egyptians lined up in record numbers—at seventeen theaters in Cairo alone—to see not the latest ‘Adil Imam comedy, Nadia al-Guindi potboiler, or foreign thriller but a meticulously researched and restaged treatment of the 1956 Suez crisis, the nationalization of the Suez Canal Company by the relatively young Nasser regime and the subsequent Tripartite Aggression that did so much to put Gamal Abdel Nasser and his comrades on the world map. Nasser 56 has already earned a place in Egyptian cinema history; it has also rallied, unnerved, and astonished people on all sides of an ongoing debate over the legacy of Nasser’s eighteen-year rule. Ultimately, it will play a major role in the shaping of public memory of the man who dominates contemporary Egyptian history, of a social revolution that is recalled with increasing fondness, and of an era of cultural production that even cynics concede was golden. Public memory, as the American historian John Bodnar suggests, “is a body of beliefs and ideas about the past that help a public or society understand both its past and present, and by implication its future.” “The major focus of this communicative and cognitive process,” he continues, “is not the past, however, but serious matters in the present such as the nature of power and the question of loyalty to both official and vernacular cultures” (1992, 15). Memory, the oral historian Alessandro Portelli reminds us, “is not a passive depository of facts, but an active process of creation of meanings” (1991, 52). Similarly, Robert McGlone, writing about memories of John Brown’s raid on Harper’s Ferry, describes the process of recall as “rescripting…not a deliberate rewriting of the past, but a transformation in the controlling expectations and logic of life situations [that] refocuses an individual’s self-schema.…Rescripting adds or takes away information to make a life story coherent and believable at a particular time” (1989, 1182–83). How might this apply to the scripting of a new text about Nasser and its imaging on celluloid? Historical films raise questions about “history as a mode of knowledge, of historical accuracy, of memory and desire.…More than other genres, the historical film evokes a sense of the ‘grand,’ the visually enthralling, the huge canvass to portray the sweep of events that the past as completed action allows” (Chakravarty 1993, 183). No less for the viewers than for the filmmakers, we might add. So why Nasser? Why this particular story? How have the filmmakers, in this case scenarist, star, and director, chosen to bring the script to life? And why has the enthusiastic popular response both pleased and caused disquiet in official circles, including those that backed and promoted the project? Nasser 56 is the brainchild of the veteran scenarist Mahfuz ‘Abd al-Rahman in collaboration with Egypt’s leading dramatic film star, Ahmad Zaki, who plays Nasser, and the veteran television director Muhammad Fadil. Originally intended as one of a series of hour-long dramatic biographies of Egyptian luminaries for television, each figure to be played by Zaki, the project blossomed into a full-length feature film on a grand scale. Produced by the state-owned Egyptian Radio and Television Union (ERTU), the film was three years in the making, from initial conception to preview release in July 1995. Key portions were shot on brand-new outdoor sets at the 6 October Media Production City, the $300 million project designed to reinvigorate the flagging Egyptian film industry and maintain Cairo’s virtual monopoly on Arab television production (Khalil 1996a; Saad 1996). The film then sat another full year, “frozen” is the word used by its creators, before its release in early August 1996. Fig. 1. Ahmad Zaki as Gamal Abdel Nasser; announcement for the official preview of Nassar 56 at the opening of the 1995 Television Festival. Courtesy of Mahfuz ‘Abd al-Rahman. Nasser 56, trumpets its ad, covers “one hundred days that changed the world.” The actual span is 106 days, from June 18, 1956, Evacuation Day, until November 2, several days after the outbreak of war. The film opens with Nasser taking down the Union Jack; it closes with a famous speech from the minbar of al-Azhar Mosque. As bombs fall around Cairo, Nasser proclaims that Egypt will fight on and never surrender. Much of the action focuses on political deliberation among Egypt’s leadership, formulation and implementation of the secret plan to secure the canal as Nasser addressed the nation from Alexandria on the night of July 26, and the subsequent political maneuvering of Nasser and his colleagues to defuse a crisis they cannot believe is escalating. Other well-known historical faces appear in subsidiary roles, among them military comrades Anwar Sadat, ‘Abd al-Hakim ‘Amr, Salah Salim, Zakariya Muhyi al-Din, ‘Abd al-Latif al-Baghdadi, and Sami Sharaf and civilian associates Fathi Radwan and Mahmud Fawzi. More prominent supporting figures, such as the chief canal engineer, Mahmud Yunis, and his colleagues, are less familiar to many Egyptian viewers. There are no Egyptian villains in the piece, save for a small, rather pathetic group of old-regimistes who petition Nasser to resign in the wake of the tripartite attack. The film was shot in black and white to effect a newsreel feel. In the opening scene the camera shoots Ahmad Zaki from a distance, a deliberate strategy to draw the audience, especially elders, into accepting an actor—and such a well-known face—as Nasser. Other characters are played by less familiar, younger actors, closer in age to their characters, also a deliberate move to keep the film from becoming a parade of stars. Documentary footage of world leaders and combat punctuate this and provide broader context for the story line. The only world leaders to appear in the scenario are Nehru and Australian Prime Minister Menzies, played by opera star and character actor Hassan Kami, Egypt’s master of foreign accents. The black-and-white film also touches directly on a national bias for the classics, a nostalgia for black and white, from the era before color became the norm in the early seventies. Historical accuracy aside—and the debate was quickly engaged on levels great and small—the film’s success rests ultimately on popular reaction to the characterization of Nasser. Ahmad Zaki has by all accounts, and with only a minimum of makeup to fill out his jaws and recede his hairline, turned in a bravura performance that captures Nasser’s personality, demeanor, speech patterns, and, ultimately, charisma. This is important, because for the generations born after Nasser’s death in September 1970, Zaki will, for better or worse, come to personify his subject. The filmmakers, well aware of the burden on their shoulders, paid meticulous attention to detail, shooting on location whenever possible, attempting to re-create sets based on photographic evidence, and endeavoring to balance conflicting memories about the most prosaic specifics: the physical layout of the Nasser household or the brand of cigarettes Nasser chain-smoked. The casting of Ahmad Zaki was both a foregone conclusion, because of his personal role in promoting the project, and a natural selection. Zaki has been Egypt’s premier dramatic actor since the late 1980s. Perhaps too often typecast in recent years as the poor boy trying to infiltrate the upper strata or as the social rebel, and recently reduced to plot-weak action films, he remains a powerful screen presence, a major box office draw, and occasionally a trendsetter. He is also dark, rare for an Egyptian leading man (or woman), probably the darkest ever. He can, and easily does, approximate Nasser’s sa‘idi (Upper Egyptian) features. The rest is pure acting, and Zaki reportedly threw himself into the project and character, taking on Nasser’s persona on and off camera. Fig. 2. A familiar guise: Ahmad Zaki as social rebel in ‘Atif al-Tayyib’s Didd al-hukuma (Against the Government, 1992). Photograph by Joel Gordon. Regardless of critical or popular reaction, the film will remain a milestone in Egyptian and Arab cinema history. It is the first film to dramatize the role of any contemporary Arab leader—with apologies to Youssef Chahine’s 1963 rewriting of the Crusades, al-Nasir Salah al-Din (Saladin the Victorious), which portrayed the Kurdish Saladin as a pan-Arab champion, clearly alluding to Nasser—and the first Egyptian film to treat such a significant historical period in anything but caricature. A handful of Egyptian feature films in the mid- to late 1950s dramatized the Suez conflict, some as backdrop, several directly. War stories, focused on steadfast soldiers and civilians, they depicted the struggle against traitors at home—a frequent invective in early Nasserist rhetoric—as well as imperialism (Ramzi 1984).Nasser 56 decidedly has a point of view. It is a nationalist film—one Egyptian writer has called it a “quiet nationalism” (Ken Cuno, pers. com. April 1997)—but not a propaganda film in the classic sense. The target is no longer imperialism and Egyptian traitors but rather a present that has become detached from the moving spirit of a bygone era. If not a clarion call to restore that spirit, Nasser 56 is certainly a lens through which to reimage and reassess that which has been lost. The most critically acclaimed scenes are those that depict Nasser interacting with common Egyptians, praying in public, or at home with his family, an overworked father trying to balance politics with his children’s desire for a beach vacation. In an early scene Nasser converses with a canal worker who has been sacked by European overseers, and is moved by the injustice of his plight. Up late in his study, he answers the telephone three times after midnight, only to find on the other end a peasant woman newly arrived from the village, looking for her son. The third time, flustered by her unwillingness to accept that she has not reached Hagg Madbuli, Nasser identifies himself: “I am Gamal Abdel Nasser.” Silence, then: “God save you, my son [Rabbina yansarak, ya ibni]” (‘Abd al-Rahman 1996, 32). Almost everyone’s favorite scene is stolen by the veteran actress Amina Rizq, who has been playing tradition-bound matriarchs for the past forty years. Here she plays a persistent peasant woman who demands and is allowed to meet the president. Once inside she relates the story of her grandfather, a peasant killed digging the canal, and presents Nasser with the man’s robe, a family heirloom. “When I heard you on the radio,” she asserts, “I said, by God, Umm Mustafa, this Gamal has avenged you and eased our hearts; so I am giving you this robe because you are most deserving of it” (1996, 119–20). Fig. 3. Nasser (Ahmad Zaki) praying for the nation in Nasser 56. Courtesy of Arab Film Distributors. They could easily be writing a contemporary script for formal and informal discussions of Nasser’s personality and legacy with Egyptians from all walks of life. Egyptians who lived the Nasser years, including many who spent time out of favor and in prison (although less so those who suffered economic dislocation), still speak with exceptional warmth about Nasser. Grand politics, successes and terrible failures aside, they recount seeing him walking the streets or driving unguarded in his car. They rarely, if ever, stopped to greet him, but, more important to their personal rescripting, feel they could have. In much the same fashion, Mahfuz ‘Abd al-Rahman has described Nasser as “a man of the utmost simplicity and modesty,…a man of simple dreams,” for whom “the pleasures of life consisted of olives and cheese, going to the cinema, listening to Umm Kulthum” (1996, 6–7), a man who “could not comprehend a home with two bathrooms,” let alone a private pool (pers. com.). In interviews Ahmad Zaki, whose career blossomed at the tail end of the 1960s, has spoken of Nasser as a father figure (Ramadan 1995). 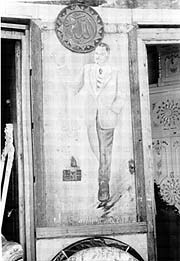 The very depiction of Nasser, albeit imaged as Ahmad Zaki, startles. For nearly two decades his likeness was everywhere, and he remains the symbol of the iconized Arab ruler (Ossman 1994, 3). But those images came down in rapid succession following Sadat’s ascension to power. Where they could not come down, as at the rarely visited monument to Soviet-Egyptian friendship at the Aswan High Dam, Nasser’s profile was all but hidden by a superimposed image of the inheritor. Private establishments still display personal icons, and one bust remains in an arcade in downtown Cairo. Once the heart of the cosmopolitan city, the area is now primarily shopping turf for the lower middle class, and the arcade is particularly rich in its selection of conservative headwear for women. There is no designated monument to Egypt’s most significant ruler of this century, no stadium, airport, public building, or major thoroughfare that bears his name (a Nile-side boulevard running through Imbaba officially does, but it is universally referred to as Nile Street). Nasser’s tomb, unlike Sadat’s, is not visited in any official commemorative capacity. There is a Nasser subway stop, but it is adjacent to a fading city center, one that is not heavily used. Fig. 4. The iconic Nasser outside a corner shop in a popular district of Cairo. Photograph by Joel Gordon. Nasser’s name still evokes great passion, and approbation is by no means universal or unequivocal. Like any regime seeking to foment and sustain a revolution, the Nasserist state razed before building, disrupted lives and careers of opponents, and devoured some of its own. The legacies of Nasserism remain multiple and will be weighed differently by different generations, proponents of different political and social trends, sons and daughters of different social classes. Nasserism is held accountable by some for virtually every social ill facing the nation, from traffic snarls and pedestrian anarchy to the fall of social graces. Nasser has been accounted a traitor by Islamists, a prisoner of his class by leftists, a tinhorn tyrant by scions of the old parties and aristocracy. The Nasserist political experiment is widely accepted to have failed in its stated goal of restoring a “sound” democracy. Arab Socialism, the economic strategy that produced nationalization and the creation of a vast public sector, will continue to polarize Egyptians, although the debate may increasingly turn on intentions versus consequences. Nasserist foreign policy, Arabism and nonalignment, the conflict with royalist neighbors and Israel, also polarizes, and the generation that lived the period will always live in the shadows of Yemen and June 1967. As the era grows more distant, historical perspective may help to contextualize the logic of certain directions and policies. Greater historical focus has already produced notable changes in the ways in which Nasserism has been envisioned—and debated—in the quarter century since Nasser’s death. Yet, contrary to Bodnar’s (1992, 13–19) thesis—which may well hold for his American context—in which vernacular traditions gradually become subsumed into an official text, in Egypt, and presumably in other countries where an official discourse quickly and effectively silenced all others, the process seems to be going in the opposite direction. Vernacular discourses, allowed a voice after two decades, quickly drowned out the official text, leaving public memory of Nasserism very much up for grabs. Nostalgia in Egypt today is a complex phenomenon. The majority of the population was born after 1967, and many after Sadat’s assassination in 1981. Less than Nasser’s shadow, they have grown up in a society in which popular memory is dizzyingly multivocal. In the past two decades, during which Egyptians have been free to openly debate their history, vernacular antihistories related by representatives (some self-styled) of old-regime parties, royalists, leftist movements, and the Muslim Brothers have emerged from the underground to become standard counterorthodoxies to the official Nasserist account of the revolution. Those affiliated with the Sadat regime comprise another orthodoxy caught between competing prior legacies. The Nasserist response, official and not, has become just another vernacular tradition competing for public memory. Ten-year anniversaries, by their very nature as discrete constructs to mark and evaluate the passage of time, provide a convenient referent. In July 1972 the country still grieved Nasser’s passing yet applauded Sadat’s dismantling of the state security apparatus, the release and welcome home of political prisoners and exiles, and the purging and incarceration of those who had dominated the “centers of power” (marakiz al-quwwa). Ten years later, when the revolution turned thirty, Egypt again faced a change in leadership, power having been transferred suddenly in a moment of national crisis. A new regime now curried favor by opening political prison doors, by prosecuting a new cohort of power abusers, and by lending freer rein to opposition voices to speak, write, and ultimately participate in government. One consequence was a frank and multivoiced discussion of the political origins of the Nasser revolution, before and particularly after the July coup. The focus remained political, the general assessment of Nasserism critical, intensified by recollections of a period, 1952–55, when the officers squandered much of the goodwill that greeted their takeover and imposed their revolution by coercion more than charisma (Gordon 1992). As the revolution turned forty, a pronounced shift in emphasis was under way. The exploration ten years earlier into political failure had been fueled by hopes of a truly broadened liberalism. By the early 1990s much of that hope had turned cynical. To a society riven by malaise, and at times and in certain places by interconfessional strife, Nasserism has increasingly come to represent an era of hope, unity, national purpose, social stability, and achievement. This was reflected in sentiments voiced on the street as well as in the press, official and opposition, where a growing number of Egyptians recalled a society in which there was a shared sense of community in which common, enlightened aims predominated and in which religion did not create barriers (Gordon 1997b). Underscoring this nostalgia, and recalled increasingly by Egyptians, are recollections of a golden age of popular culture. The Nasserist state promoted and subsidized cultural production on many levels: classical Western dance and music, folklore, history, cinema, theater, radio and television drama, fiction, poetry, comedy, the fine arts. In retrospect much of it may have been hackneyed, too ideologically grounded, too often in the hands of bureaucrats rather than creative artists, some of whom left the country. Yet such assessments beg the issue of nostalgia. The faces and voices of popular movie stars and singers from the 1950s and 1960s—Fatin Hamama, ‘Abd al-Halim Hafiz, Rushdi Abaza, Shadiya—have become deified. Film classics by Salah Abu Sayf, Kamal al-Shaykh, or Barakat—before and after nationalization—and even the B-films of Niyazi Mustafa and Hilmi Rafla will never be equaled. Nor will the lyrics of Salah Jahin, Ahmad Shafiq Kamil, and ‘Abd al-Rahman al-‘Abnudi, paired with tunes by Kamal al-Tawil, Muhammad al-Muji, and Baligh Hamdi. These sentiments are echoed even by many who are otherwise highly critical of Nasserism and work to undo its economic and political legacies. Implicit in the family scenes, the images of simplicity, Nasser’s meals of cheese and olives or Mahmud Yunis sleeping on his office floor, the scenarist seeks to recapture and reimpart a sense of what Egypt was and has lost. Mahfuz ‘Abd al-Rahman, like others of his generation, those who came of age under Nasserism, is rescripting the period with a focus on an enlightened community rooted in twin notions of progress and independence. His other great project in recent years has been a major revision of Khedive Ismail (1865–79), through the vehicle of a television serial that has aired over three Ramadan seasons, the prime month of television viewing (Abu-Lughod 1993b; Gordon 1997a). Bawwabat al-Halawani (Halawani’s Gate) spins a tale of court intrigue that revolves around the romance between the musician ‘Abduh al-Hamuli and his protégée Almaz, a poor girl taken from her parents and brought up in royal circles. But the backdrop is Ismail’s desire to modernize his country, the financial and political costs incurred, and, ultimately, the Suez Canal. Dismissed by much of Western scholarship and Nasser-era history as a foolish spendthrift who, entranced by Westernization, broke the state, Ismail emerges under ‘Abd al-Rahman’s pen as a Renaissance man, a prisoner not of false illusions but of an international power structure that will ultimately not permit an independent Egypt. In many ways the two projects, Nasser and Ismail, go hand in hand. Whatever their failings and failures, both leaders promoted cultural enrichment as a means toward liberation, and both ultimately confronted forces larger than they or Egypt. Both projects also promote a paradigm that the state, for slightly different reasons—and obviously with less comfort in the case of Nasser—finds acceptable and beneficial in its confrontation with its most powerful vernacular challenge, Islamism. Egyptian television has always served to “produce a national community” (Abu-Lughod 1993b, 494). Yet, as Lila Abu-Lughod and others have noted, in recent years television serials (and the cinema) have become rostrums in “the most pressing political contest in Egypt…the contest over the place of Islam in social and political life” (1993b, 494). Long ignored, strikingly absent from drama that purportedly depicted contemporary society, Islamist characters have become almost stock figures in television serials and the subject of one major motion picture, Al-Irhabi (The Terrorist; Jalal 1994; see Armbrust 1995). Always militant—and misguided—they generally meet unhappy ends at the hands of their “brothers” after recognizing the error of their ways. ‘Abd al-Rahman’s reexamination of the past has always been a personal search for the drama inherent in the historical moment (‘Abd al-Rahman 1991). His work has spanned time and place, from early Islamic Iraq to modern Egypt. For him the dramatist has freedom to explore questions the historian cannot, but the dramatist must be bound by the historian’s reliance on evidence. He is an indefatigable researcher who has battled both stolid academics, wary of the writer’s craft, and, at times, popular historical and literary wisdom, against which his scripts have rubbed. ‘Abd al-Rahman’s favorite anecdote involves a particularly obdurate actor who, protective of his good-guy popular image, refused to play a brother of the legendary Arab hero ‘Antar ibn Shadad, even though the script, which he had not read, revised the role, portraying the brother in a much more sympathetic light. At the same time, like others who maintain intellectual independence yet work in or for the state-run media, ‘Abd al-Rahman participates in “a shared discourse about nationhood and citizenship” (Abu-Lughod 1993b, 494) and thus represents at once a personal and quasi-official voice. To champion Ismail is, in today’s discourse, to counter the Islamist claim to authenticity, one that would view Ismail’s Westernization as anathema. Likewise, to script Nasser at Suez, to depict such a powerful moment of national unity, serves, among other things, to counter social trends that are nationally divisive, even “un-Egyptian.” It is notable that the original cast of characters out of which the Nasser film emerged included products and leading champions of Westernization: Rifa‘ al-Tahtawi, ‘Ali Mubarak, and Taha Husayn. This is not to suggest that state production officials who backed the project, or the creators, envisioned it consciously as a weapon in the battle against Islamism. At the same time, the green light to make a film about Nasser, and one of such scale, could not have been given without serious consideration. Support for the film clearly represented a gamble—that viewers would rally around the moment, rather than the figure, and that the moment, one of national unity in the face of specific historical foreign aggression, would not transcend historical time/place to mirror more recent national struggles with foreign creditors (World Bank, International Monetary Fund), struggles in which the government in its drive to privatize the economy is often portrayed as serving personal and foreign interests. What government officials obviously did not bank on was the degree to which the film, by so powerfully imaging the crisis, the personalities, the national moment, would underscore present-day malaise and popular perceptions of their own inadequacies—and, ultimately, the degree to which the film would resurrect the image of its hero. The spirit of the film, a labor of love for its creators, proved infectious to those who encountered its images, even in production. The author has recounted with impish delight how a staged workers’ rally on a studio set turned real. A crowd of extras, all workers hired for the occasion—cynics will note the irony—caught sight of Ahmad Zaki and, unrehearsed, began chanting “Nasser! Nasser!” Zaki, who immersed himself in Nasser’s character while on the set, spontaneously began orating in character, and the workers responded with greater vigor. Their ardor fueled Zaki’s performance, and performance quickly melded into reality. The assistant director, unprepared for a sound take, shouted for a cut, but the director, Muhammad Fadil, intervened and ordered the cameras to keep rolling. 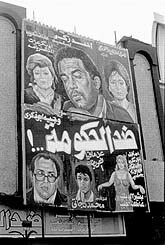 The response to the film’s preview, before an invitation-only audience at the opening of the Cairo Television Festival in July 1995, provided another occasion for a spontaneous rally. According to observers, people in the audience applauded, shouted encouragement, and wept openly. The inclusion of several anthems from the Suez crisis, some not heard in nearly a quarter century, punctuated the response. “The day before yesterday I saw Nasser 56, and my eyes filled with tears to see Ahmad Zaki embody the character of the late leader who made such great sacrifices for the sake of our national honor,” wrote one attendee (Mustafa Bakri 1995). Mahfuz ‘Abd al-Rahman recalls how a young man embraced him and Zaki a day after the preview and announced that he had now fulfilled his dream of meeting Nasser. Such demonstrations before and after the preview may have given the government cause to rethink its promotion of the film. Critics lavished praise on Information Minister Safwat al-Sharif and ERTU Production Sector chief Mamduh al-Laythi and encouraged them “to undertake similar nationalist projects that reflect shining moments in Egypt’s history” (Mahmud Bakri 1995). Then, suddenly, the film was put on ice, its scheduled theater release delayed indefinitely. No one offered a definitive reason. Official circles noted that final sound and print work was under way abroad. Skeptics suggested the film had been received too well, that the outpouring of emotion was not appreciated in the state’s upper echelons, especially with parliamentary elections upcoming. Questions of video recording (and pirating), foreign rights, and television and satellite access complicated the matter. The Arab world was abuzz with anticipation. Syria and Libya supposedly offered to buy rights to air the film; so, according to the rumor mill, had the Saudis, but with ulterior motives. A stalling game ensued that effectively delayed release for a full year. Cynics offered the following scenario: the fall 1995 election season was deemed inappropriate, then came Ramadan, when theaters traditionally do poorest, then the postholiday season of popular comedy-adventure blockbusters. The film did not seem to fit the calendar. In seeming incongruity with official desires to deflate, if not suppress, the film, teasers remained. A marquee arch on Gezira Island constructed before the 1995 Television Festival and left in place until the following summer featured a prominent photograph of Zaki/Nasser among other favorite productions. So did a display outside the Radio and Television Building. If those displays reached a limited audience, discerning eyes could not help but notice a final dramatic image of Zaki/Nasser on the promotional leader that identified 1995 ERTU television productions. Ironically, the film’s opening, days after the fortieth anniversary of the Suez Canal nationalization, proved far more potent than an earlier release might have been. For the great majority of adult Egyptians who lived it or were raised in its wake, the Suez crisis represents the ultimate moment of national pride, purpose, and unity. Two other historical moments in this century, pinnacles of contested political legacies, rank closely: the 1919 Revolution and the 1973 October War. Neither is as central to the historical experience or is embedded in the consciousness of Egyptians in quite the same way, in large part because the canal had been for nearly a century the key symbol of national humiliation at foreign hands. “To my generation the Suez Canal was the core of Egyptian politics,” explains Mahfuz ‘Abd al-Rahman. When he set out to dramatize the Nasser years, ‘Abd al-Rahman deliberately chose the Suez crisis because it was the one period about which there is little, if any, dispute and because it was with Suez that Nasser’s star rose. Suez occurred after the disappointments of the liberal era, amid the confused early years of military rule. Nationalization and the subsequent Tripartite Aggression lodged Nasser in people’s hearts and ushered in an era of regional dominance that, however flawed in retrospect, has never been recaptured. In unguarded moments even the sons and daughters of discarded pashas—no doubt Muslim Brothers as well—will admit that they stood in the streets weeping, cheering, and shouting acclaim for nationalization. The Suez anniversary prompted a far broader retrospective for Nasser and Nasserism than any other anniversary in recent years, and certainly more than the fortieth anniversary of the revolution in 1992. Revolution Day has lost most of its meaning to the average Egyptian. It is a day off for government workers. The president addresses the nation with a text that changes little from year to year. One of the national television channels traditionally airs an afternoon matinee, one of several classic stories of evil pashas produced in the years after the revolution (Rudd qalbi [Return My Heart], Dhulfiqar 1957b, based on Yusuf al-Siba‘i’s epic novel, has been the favorite). Sadat, once he felt secure in power, attempted to camouflage the revolution’s anniversary behind that of Egyptian television, aired first on Revolution Day in 1960. Under Hosni Mubarak the state still acknowledges its kinship to the broad goals of the July revolution (even as it continues to dismantle fundamental pillars of its social-reform legacy in a drive to privatize the economy). But forty years later the progenitor remained largely ignored. In 1996, however, the combined July anniversaries of revolution and nationalization inspired far greater coverage. Opposition papers sympathetic to Nasser’s memory, even the Liberal party’s al-Ahrar (July 22), published larger-than-usual special editions. The July 22 issue of al-Hilal, the venerable journal of popular literature and philosophy, posed the question, “What has happened to Egyptians, 1956–1996?” Ruz al-Yusuf, the widely read weekly of politics and the arts, abandoned its traditional “Where Are They Now?” July 23 format and asked three leading scenarists, including ‘Abd al-Rahman, to script “What If [the Free Officers coup had failed]?” Reflecting Egypt’s current passion for historicals, the editors noted wryly that “writers’ imaginings are worth far more than historians’ truths.” Sawt al-‘Arab (Voice of the Arabs), the radio station most associated with Nasserism, broadcast a two-hour special on the Suez Canal, “Hadduta Misriyya” (An Egyptian Tale), that included interviews and nationalist songs. Television aired old documentary footage with nationalist songs in the background. In addition to the celebratory atmosphere surrounding the Suez anniversary, the state has also recently decided that the time has come to participate in the shaping of public memory of Nasserism. In 1992 the government sanctioned formation of the Nasserist Arab Democratic party. By its very presence, the party has restored quasi-official legitimacy to the use of Nasser’s image as political icon. But the state no longer seems to be willing to consign Nasser to the Nasserists. Long-range plans are under way for a museum to be housed in the offices of the Revolutionary Command Council, a former royal rest house on the southern tip of Gezira Island (Khalil 1996b; Abu al-Fath 1996). Music, too, has been appropriated: when Arab leaders gathered in Cairo in June 1996 to consider implications of a newly elected Israeli government, the theme song chosen by state-run media was “al-Watan al-Akbar” (The Greater Nation), a stirring anthem to Egyptian-Syrian unity composed by Muhammad ‘Abd al-Wahhab and Ahmad Shafiq Kamil in 1958. For Revolution Day 1996, television stations aired five movies over two days, four during prime time. The proliferation of regional broadcast in recent years—households with a reasonably good antenna now receive nine terrestrially beamed channels—added to the scope of what was unprecedented coverage of this holiday. The change of heart is rather sudden and seems to be prompted both by a desire to keep in step with and to play a hand in shaping the wave of resurgent nostalgia for the Nasser era (Sipress 1995). Modern history has been in vogue in Egypt for the past few years, fueled in large part by Mahfuz ‘Abd al-Rahman, Usama Anwar ‘Ukasha, and other prominent scriptwriters who have penned historical dramas for television that attract wide audiences and have been extended over several seasons. The nineteenth century and prerevolutionary era of pashas and nationalist struggle are particular favorites. Their influence has recently rolled over from the little to the big screen, although with much less panache or success. Consequently, the tarboosh, Farouk and Queen Farida, and Ismail, have become popular images on T-shirts, in window displays of upscale shops, in television commercials geared toward young professionals, even in traditional “fast-food” eateries. The popularity of such items and images reinforces notions of creative rather than passive consumption, and should give those of us who read these melodramas as text cause to reconsider how their audiences in fact imagine them (Ang 1985; Armbrust 1996). Still, Nasser 56, because its subject is so recent, in the living or at least public memory of so many Egyptians, and because of its immediate political subject, is more serious business. Demographics, the passing of the old-regime generation, the rise to prominence of the generations that lived and were shaped by Nasserism, and “serious matters in the present” point Egyptians ever more in the direction of Nasser and his era. The foundations of a resurgent nostalgia are a complex construct of political cynicism, uneven development, glaring social inequities, unfulfilled material expectations, and the vise of radical Islamist and state violence. Amid all this Egyptians are confronted daily with an alternative vision. Radio and television remain dominated by the cultural production of what was by all accounts a golden age of artistry. The songs, concert and comedy stage clips, and movies that captivated a generation still work their charms amid all that is new. Young boys in the street still croon ‘Abd al-Halim Hafiz songs (Gordon 1997a), and teenage girls still fall for Rushdi Abaza’s Egyptian-Italian eyes. If their loyalties are divided and distracted by younger—and foreign—stars, they still recognize the genuine national-cultural articles for what they are. Historical memory among Egyptian youths is short. When Port Said (Dhulfiqar 1957a), a propaganda film about the Suez War, aired in June 1996—on the anniversary of Evacuation Day—the newspaper movie listing explained the historical context as if describing an event much longer past. That was several months before Nasser 56 hit the theaters. Now the Nasser generation is reliving the period, rediscovering nationalist anthems that stirred their youth. “We have waited forty years for this film,” wrote one reviewer. “And because we waited so long, I found myself sitting in anticipation, my eyes, ears, and heart tuned in anticipation” (al-Ghayti 1995a). And a younger generation is asking their parents about the period. The filmmaker Yusuf Francis (who has recently directed a historical film about Howard Carter) sat near an eight-year-old boy at an evening screening who pressed his father for details, then turned to him after the film ended to ask, “What happened next?” Egyptians in their twenties and early thirties are no less curious. The popular response to Nasser 56 has taken all involved by surprise. State officials have been quick to reassert their positive role in its production, notwithstanding the obvious irony of a state-funded film glorifying nationalization in the age of privatization and championing a charismatic, idolized ruler in an era of political malaise. The most cynical observers still fear the film may never make it to television, that “like many political films that the film industry has produced, it will be locked away in a can after ending its run in Egyptian theaters” (Khalil 1996). For the true believers, the Nasserist faithful, Ahmad Zaki has thrown a little water on the fire, reasserting his desire to now play his other hero, Anwar Sadat. And Mahfuz ‘Abd al-Rahman has provoked unease in various circles by evincing a willingness to accept the challenge, put forth by critics who accuse him of taking the easy road via Suez, to pen Nasser 67 as a sequel (al-Hakim 1995). Other contemporary history projects are in the works. ‘Abd al-Rahman has been scripting a serial about Umm Kulthum, and Zaki says he intends to film the life of ‘Abd al-Halim Hafiz. With the silver anniversary of the October 1973 war approaching, the Egyptian defense ministry announced its willingness to support—with guns, manpower, technical expertise, and financial aid—a silver screening of “the crossing” (al-‘ubur). However, a controversy over who should script the film has held up preproduction. In the Manichaean intellectual world of Nasserists and Sadatists, the leading candidate, Usama Anwar ‘Ukasha, is considered to be the former, and this is deemed unacceptable by the latter. ‘Ukasha retorts that his script will feature not the commander but the common soldier. This fails to appease his critics, who well sense the implicit barb. The Defense Ministry has announced its unhappiness with several draft scripts, implying a threat to withdraw support. For the time being Nasser and Suez serve as springboards for the rediscovery and rescripting of an era that so far defies official ossification. On the heels of its Egyptian success Nasser 56 has played to audiences outside Egypt. The first screening scheduled was a single screening in Paris in June 1996 before the Egyptian opening. Shortly after its Egyptian premiere the film played to great acclaim in Gaza and the West Bank. The film has since shown in several cities in the United States—“The Arab film event of the year”—and is currently available on video with English subtitles. To non-Egyptian Arabs and to Arab diaspora communities the film undoubtedly conveys other particular meanings, addressing Nasser’s legacy in a broader Arab context.Nasser 56 may be a flash in the pan; some certainly hope this will be the case. Conversely, it may become the Revolution Day television matinee, which, if it displaced the classics, would be a shame. Within Egypt the film clearly does speak to “serious matters of the present,” and it may well inspire, or perhaps become—if it is allowed to be—the monument to Nasser that never was. Earlier drafts of this chapter were presented to the Colloquium on the Politics of Culture in Arab Societies in an Era of Globalization, held at Princeton University in May 1997, and to the culture studies group at the University of Illinois–Urbana. Participants’ feedback was greatly appreciated. Special thanks to Walter Armbrust, Marilyn Booth, Ken Cuno, JoAnn D’Alisera, Sonallah Ibrahim, and Robert Vitalis. Funding for a broader project on Nasserist civic culture was provided by the J. William Fulbright Foreign Scholarship Board, the Joint Committee on the Near and Middle East of the Social Science Research Council, and the American Council of Learned Societies. I am, above all, deeply indebted to Mahfuz ‘Abd al-Rahman and Samira ‘Abd al-‘Aziz for their hospitality, insight, and candor. 1. Mahfuz ‘Abd al-Rahman pers. com. 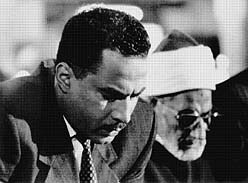 ; all other references to ‘Abd al-Rahman or Nasser 56, unless otherwise indicated, are from personal conversations that took place in Cairo between November 1995 and August 1996. 2. The filmmakers reportedly approached Su‘ad Husni to play Nasser’s wife, Tahiya, but she was unable to take part. Ahmad Zaki then suggested Firdaws ‘Abd al-Hamid (al-Ghayti 1995a). 3. Kami has also played Suez Canal builder Ferdinand de Lesseps in ‘Abd al-Rahman’s other mammoth hit, the television series Bawwabat al-Halawani (Halawani’s Gate), which ran three successive Ramadan seasons through 1996. 4. In a variant of this common wisdom, Mahfuz ‘Abd al-Rahman told me that Egyptians will always favor an Egyptian over a foreign black-and-white film and a foreign over an Egyptian color film. 5. Zaki’s filmography is long and distinguished. The great exception to the poor-boy roles is Zawjat rajul muhimm (Wife of an Important Man; Khan 1988), in which he plays an officer in the security police. A classic example of the poor-boy role, and a film that established a hairstyle fad for young men, is Kaburya (Crabs; Bishara 1990; see Armbrust 1996, 138–46). For a critique of recent disappointments, see el-Assiouty 1996. 6. Ramzi (1984) counts eight films made since that deal with the Tripartite Aggression in any way. Of these, he states, only three treated the war directly. The most noteworthy are Bur Sa‘id (Port Said; Dhulfiqar 1957a), noted below, and Sijin Abu Za‘bal (The Prisoner of Abu Za‘bal; Mustafa 1957). 7. The simple statement may recall for some Egyptians Nasser’s impromptu oration on October 26, 1954, when an assailant shot at him. 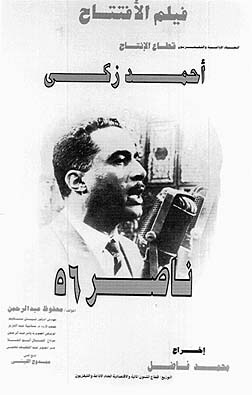 Nasser repeated the phrase “I am Gamal Abdel Nasser” numerous times, invoking a willingness to die for Egypt. It was his first great public oration. 8. These characterizations have not always been positive. However, she has most often portrayed pious, doting mothers, and she is much loved. Her casting here is a master stroke, although a few people I have spoken to find the scene somewhat contrived. 9. It sits between the two main termini, at Tahrir (Liberation) and Ramsis squares, both major works projects undertaken by the Nasser regime. These subway stops are named for Presidents Sadat and Mubarak respectively. 11. As Armbrust notes in this volume, when film students and critics refer to “serious” cinema they often restrict their gaze to the 1960s when the state, through partial nationalization of the industry, sought to promote a national cinema guided by artistic rather than commercial concerns. Armbrust (and I agree) does not dispute claims that under the lead of influential public-sector artists Egyptian cinema embarked in new directions that persisted well into the 1970s. Yet he challenges the elevation of public-sector cinema by positing a “golden age before the golden age,” which encompasses all commercial films made before the 1960s. My own research into Nasser-era nostalgia leads me to conclude that when people who lived the era think in terms of cinema, they recognize, consciously or intuitively, that a new generation of directors and film stars came into their own and put a distinctive stamp on Egyptian cinema in the 1950s that carried over into the following decade. Their work undoubtedly was shaped by the onset and course of the Nasser revolution and constitutes, I would argue, a new, revolutionary cinema well before the “serious” cinema of the 1960s. 12. Key pillars of the Nasserist state—agrarian reform, subsidization, and the public sector—have undergone sustained attack in the past decade. See Hinnebusch 1993; Abdel-Moteleb 1993. 13. Prior to the serial the most common popular image of Ismail would have been in the film Almaz wa-‘Abduh al-Hamuli (Almaz and ‘Abduh al-Hamuli; Rafla 1962), in which the Khedive is a surrogate for Farouk, with all the familiar imagery of the debauched and deposed king. 14. The caricatures have become even bolder in the past few years. Two recent examples are al-‘A’ila (The Family), written by Wahid Hamid, and Lan a‘ish fi galabib abi (I Won’t Live My Father’s Way), based on a story by Ihsan ‘Abd al-Quddus. In the former the mistrusted Islamist is gunned down; in the latter Islamists try to run down a failed recruit. In al-Irhabi the title character is also killed after rejecting his calling. The film has become an official text and was shown on the primary television channel on the last night of Ramadan in 1997. 15. The following year the festival was expanded to become the Radio and Television Festival. 16. Also see Salih 1995. 17. Comments made on Sawt al-‘Arab, July 26, 1996. 18. The other two scriptwriters were Usama Anwar ‘Ukasha, who is discussed below, and Sa‘d al-Din Wahba, late president of the Cairo International Film Festival, who scripted a series of important—and popular—films in the 1960s. 19. For the past four years the Nasserist weekly, al-‘Arabi, has featured Nasser on its masthead. During the fall 1995 election campaign, Nasser’s image appeared on banners and posters, trumpeting the party—and the memories—more than the slated candidates. 20. The films were Rudd qalbi, Allah ma‘na (God Is with Us; Badr Khan 1955), Fi baytina rajul (There Is a Man in Our House; Barakat 1961), Ghurub wa-shuruq (Sunset, Sunrise; al-Shaykh 1970), and Shay’ min al-khawf (A Bit of Fear; Kamal 1969). 21. The most successful, in addition to Halwani’s Gate has undoubtedly been Layali al-Hilmiyya (Hilmiyya Nights), written by ‘Ukasha (for more on ‘Ukasha, see Armbrust 1996, 16–17). But there are now scores, many rerun on regional stations. 22. The undisputed queen of historical kitsch is Nadia al-Guindi. See Hani 1995. 23. Francis was quoted in al-Ahram, August 12, 1996; a cartoon in this issue shows a man watching a television commercial for seventeen consecutive showings and wondering how he can divide himself to attend them all. 25. See comments by Mamduh al-Laythi, chief of the ERTU production sector, in al-Ahram, August 10, 1996. 26. See al-Ahram, August 3, 1996; Ruz al-Yusuf, May 15, 1995; Adwy 1999. ‘Ala’ al-Sa‘dani (1996) urged Zaki to reconsider, arguing that one actor should not play two such leaders. 27. Relatives of ‘Abd al-Hakim ‘Amr, Egypt’s chief of staff, who engaged in a power struggle with Nasser in the aftermath of the defeat, was placed under house arrest, and, depending on one’s take, was murdered or committed suicide, contacted ‘Abd al-Rahman to express their concern over how the relationship would be treated (‘Abd al-Rahman, pers. com.). 28. The war over scripting this war may well prove to be far more interesting than the final product. See Essam El-Din 1997. 29. The Gaza opening was reportedly held up when local promoters could not find proper 35mm screening equipment. A projector had to be brought in from Egypt. 30. In the United States the film and video are available from Arab Film Distributors, based in Seattle. In addition to Seattle, the film has shown commercially in Portland, Los Angeles, Minneapolis, Cleveland, Boston, New York, and Washington, D.C., and was screened at the 1997 annual meeting of the Middle East Studies Association in San Francisco. For advertisements heralding the film’s importance, see Anba’ al-‘Arab (Glendale, Calif.), May 1, 1997, and Arab Panorama (La Verne, Calif.), May 10, 1997. I would like to thank Yasin al-Khalesi for these ads. 31. An Arab-American community weekly published in southern California, Beirut Times, May 8–15, 1997, headlined “a film all Arab-American youth should see.” Thanks to Yasin al-Khalesi for this information.